The 40th edition of The Ryder Cup is set to begin Friday at the Jack Nicklaus-designed PGA Centenary Course at Gleneagles Hotel in Scotland. Team USA will look to wrestle the Cup away, following the European Team’s recent dominance: Five wins in the past six Ryder Cup Matches, seven of the past nine, and 10 of the past 14. The 40th playing of The Ryder Cup, and only its second stop in Scotland in 40 years, should only add to Jack Nicklaus’ rich Ryder Cup legacy—first as a player, then a two-time captain, and now a designer of the host venue for the third time (his Valhalla design hosted the matches in 2008, when the U.S. enjoyed its latest victory, and he captained the 1987 U.S. team at his design at Muirfield Village Golf Club outside of Columbus, Ohio). The Golden Bear was 17-8-3 in six Cup appearances, with his 17 wins tied for fourth all-time for Team USA, his 10 singles’ victories ranking second, and his 18½ points won ranking fifth. Nicklaus and 2014 U.S. Team Captain Tom Watson are second on the U.S. list of most successful Ryder Cup partnerships with four wins. The Golden Bear first represented the United States in the 1969 event, when in a now-famous act of sportsmanship, Nicklaus conceded a putt to Europe’s Tony Jacklin on the final hole, ensuring that the matches would end in their first-ever tie. He was also a member of the winning U.S. teams in 1971, ’73, ’75, ’77 and ‘81. Nicklaus went on to serve as a two-time non-playing captain of Team USA, leading his team to victory in 1983 and captaining the 1987 U.S. team at Muirfield Village Golf Club. 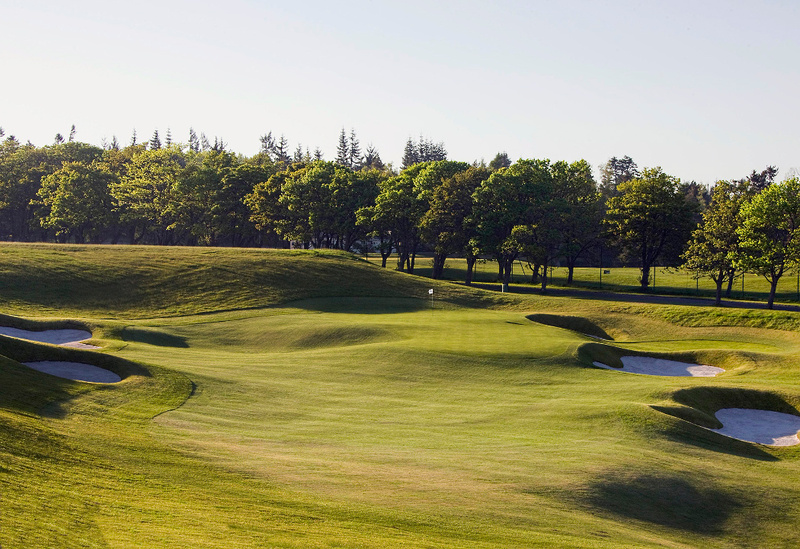 The PGA Centenary Course at Gleneagles opened for play in 1993. Nicklaus’ distinctly American-style parkland design has been host to 17 events in its short history, including the 1996 PGA Cup Matches, the 1999–2002 Scottish PGA Championship, the 2001 WPGA International, the 2003 and 2004 Diageo Championship, and the 2005–2013 Johnnie Walker Championship on the European Tour. This year, the course was named to Golfweek’s list of the Best Great Britain and Ireland Modern Courses. Gleneagles also placed first in Today’s Golfer Travel Awards as Scotland’s Best Hotel/Resort. Heading into The Ryder Cup, Nicklaus spoke in detail in this video interview about the recent renovations made to the PGA Centenary Course at Gleneagles in order to ready the course for The Ryder Cup. The Golden Bear also spoke about the importance of a U.S. victory, and what makes a good Ryder Cup captain in the Q&A provided below. 1. As the original designer for the PGA Centenary Course, please give us your opinion as to why this is a fitting course for the Ryder Cup 2014. JACK: I have always believed that you don’t build a clubhouse just for a New Year’s Eve event, and you don’t design and build a golf course just for one tournament. The way we approach the design of any golf course is to make sure it services well its members and guests first, and then put enough spice, strategy and shot values, so if you wish to host a tournament or event of any level, you can do that. Gleneagles should be no different. It is a golf course for everyone. Having said that, I think it’s an exciting course for tournament play and there are places where it will yield birdies—as well as bogeys. Look at the 14th, for example. It is a very drivable par 4, with the bunkers coming into play around the green. You want birdie chances in a golf course; that’s what the Ryder Cup is all about. The course is almost 7,300 yards from the back tees, so it’s got modern length. I think it will be very popular. If you go through the golf course, I don’t think there is a weak shot. That’s what you try to eliminate. I’m very proud of it. With the work we did a few years ago, our goal was to modernize the golf course and I think we’ve achieved that. All the people at Gleneagles have worked very hard to host the Ryder Cup and have Gleneagles put its best foot forward. I’m very flattered that the PGA of America chose Gleneagles as the host venue for The Ryder Cup. As one of the elder statesmen, to have had golf courses developed and then used for significant events such as a major championship or Ryder Cup, it’s really very gratifying. It is another aspect of the game that keeps me current, keeps me involved, keeps me interested, and keeps me really wanting to work and support the game I love. 2. How has the course been modified to meet the needs of the tournament? JACK: What we basically did over there was we revised most of the fairway lines. We brought them in a little bit for The Ryder Cup. The first hole, we adjusted the bunker off the tee a little bit. We took a bunker out behind the green and put it into a grass hollow, which we felt like probably allowed for more walk-off of the green and made better distribution for traffic. As for the shot, the grass can be equally as challenging as the bunker—perhaps even more difficult for some. With the second hole, we really didn’t do a lot there. We redefined the fairway edges and we took a deep bunker out from behind the green, which was blind. We took it out and created a grass hollow. That’s basically what we did there. Third hole, we redid the whole bunkering on the right side of the fairway and that makes for a much more attractive tee shot. With the second shot into the green, we had high grass down on the back bank to the edge of the green and we opened those back up to where it’s not high grass down the edge of the green. It is now short rough, so you have a bit more forgiving area around the green. We redid the bunker on the front and made it a little bit more visible getting into the green. Fourth hole, we didn’t really do a lot. It was already a pretty good par 3, so we made only minor adjustments. The fifth hole has a really demanding tee shot. We left the tee shot alone. Second shot, there were a couple of beech trees that were overhanging the left side, short of the green. They were getting pretty big. We took those out to open up a bail-out area short left of the green. You have water short right and a bunker left. It is a pretty strong golf hole, but I think now it’s a little bit more user friendly, to use that word again. The sixth hole, a par 3, we redid that one dramatically. I wasn’t really fond of the green. It was changed from the time I originally did it to when I came back, so we redid that green, creating more pin placements, a better relationship to a bunker on the left, and, simply, it looks like a better golf hole. Seventh hole, they had moved the green to the right. I did not move it back to where I originally designed it. I left it to the right but we redid part of the green, because you couldn’t keep the ball on it. It’s a nice tee shot, with a little second shot up the hill. It’s a pretty good golf hole. Not long, but a nice golf hole. The eighth, we really didn’t do a lot to the tee shot. We reworked the bunkers a little bit. Ultimately, you can try to risk and carry it all, over a set of cross bunkers, and get the ball very close to the green. We put two bunkers in the front right of the green and set up a couple of pin positions. It’s a better golf hole now; a nice little golf hole. Before, it was a somewhat awkwardly placed hole. I think we have a good hole there. On the ninth hole, a secondary tee was put in between the back tee and members’ tee for wind conditions, and it’s a 600-plus-yard hole. I think ultimately that will help it be a little better if conditions change. On the second shot, we have a water hazard on the right that really wasn’t in play, and so we created a secondary fairway separated to where you can take your second shot and play it up the right side, challenge the water. But you have a chance to get it up into the green, or you can play it as a three-shot hole and then the bunkers force you to play out to the left and play up the length of the green. So it’s an option hole, depending on what conditions are and how they will be able to play it—as a two-shot or a three-shot hole. I think it’s a very attractive tee shot, a very attractive second shot. I think it’s a very pretty golf hole. 10th tee, we reduced the tees a little bit to provide a little space for the gallery. It’s a little better viewing area, but we really didn’t do a whole lot to the hole. We didn’t do a lot to 11. There really wasn’t a whole lot we could do. It’s a hole that’s a lay-up off the tee, playing across a ravine. It’s a nice, short par 4. A lot of birdies will be made there, but it’s a nice hole. The 12th hole we changed from a par 5 to a par4. We had the par-5 green, but they needed a concession area, so we adjusted that hole and moved the green to the right and made it shorter. We adjusted the tee shot a little bit with the rough lines and some mounds along the left, and a bunker on the front left of the green. It’s a fairly strong but really nice par 4. The next hole is a little bit of mystery off the tee. We have got some mounds about 200 yards off the tee to sort of say, “Okay, come challenge me or not challenge me.” We had a bunker in the middle of the fairway, which we took out. I think the tee shot will create a little mystery. Once played, the mystery will not be as great. There’s a bunker that’s about 40 yards short of the green, which I wanted to remove, but I don’t know if that will happen for The Ryder Cup. It’s deceptive. I don’t think it really affects the play very much because players will get used to it. Tough, strong par 4. The 14th hole was changed from a par 3 to a par 4. It could possibly be a drivable par 4. I did not change that. I just readjusted the bunkering and so I think it’s a pretty nice little golf hole. You sort of play it to the left with an iron or fairway metal, and pitch in. Or, you take a shot at the green. It’s got some penal bunkers that come into play with the tee shot, if you don’t hit it right or hit it properly. It will be tough. The 15th hole has got good length to it. There is a nice bunker on the right side of the fairway; a long thin green; and two bunkers on the right side. Good, strong golf hole. 16 is a par 5. We’ve narrowed the fairway, and changed the bunkering up around the green. It’s a reachable par 5. I think it is a good, strong hole the players will enjoy. 17 is a nice par 3. Bunker short left, back left and right. A little bit of movement in the green, but not a tremendous amount. Just a little bit. But it’s a nice 194-yard par 3. The 18th hole was totally rebuilt. It was a par 5 prior. We kept it as a par 5/par 4. It could be played either way. We put a bunker on the right side on the tee shot. From there, we took the green and probably cut it down, oh, about 10 meters, with the fairway approach up into it, and created gallery mounds around it. We created a gambling couple of cross bunkers, a big swale over the green to the left for bail-out, but for a tough, difficult recovery. Two good shots will put you on the green. A bad first shot without a favorable lie, or a good tee shot but a bad second, will put you in a hard position to make 4. I don’t think you’ll find a lot of 6s being carded on this golf hole, but I think you’ll find some eagles, you’ll find some birdies and you’ll find some players who are not going to be happy with making par. 3. What will be the most challenging parts of the course during the tournament? JACK: Well, I think, you know, any time you’re playing golf in Scotland, particularly the end of September, weather will probably play a large factor in what goes on. I think that if played in fairly benign weather, I don’t really consider it an extremely difficult golf course. With favorable weather and firm conditions, the golf course can play as tough as you want it to play. I think the weather will be the determining and demanding factor. You’re going to see a lot of pretty good golf scores, because I don’t think Gleneagles was intended to be a back-breaking golf course—just a good, solid golf course. In September you’ll see a lot of 66s or 67s, which will provide a lot of excitement for the match-play element and provide everyone with a good event. 4) What is special or unique about this course? JACK: It’s still my only golf course in Scotland. I think it’s a bit of a combination between an American golf course and an inland Scottish golf course. It’s got a lot of target greens and target shots. It also has a lot of run-up shots, too. I think both of them will be there. 5) What is the winning ingredient for Ryder Cup success? JACK: It will be a good match, but I’ve never felt that it was real important who won. That’s never been to me the purpose of The Ryder Cup. You know, I think everybody certainly goes in with the goal to win The Ryder Cup. But The Ryder Cup is a goodwill match. It’s a match between two golfing organizations but with the goal to bring them closer together in international competition. That was always the spirit in which I thought The Ryder Cup should be played. We play enough golf tournaments where we beat each other’s brains in. I think the press makes more out of it than the players make out of it. But there is always bragging rights.